The BFE, in association with Routledge, publishes the scholarly journal Ethnomusicology Forum (formerly the British Journal of Ethnomusicology). Since 2011, the journal appears three times per year. Volumes focusing on a specific theme and prepared by a guest editor alternate with general issues that include a range of articles covering a broader field of interest. The journal seeks to provide a dynamic forum for the presentation of new thinking in the field of ethnomusicology. Ethnomusicology is defined broadly as the study of "people making music", encompassing the study of all musics, including Western art music and popular musics. The articles published in Ethnomusicology Forum often emphasise first-hand, sustained engagement with people as music makers, taking the form of ethnographic writing following one or more periods of fieldwork. The final issue published under the name British Journal of Ethnomusicology was volume 12 number 2 (2003). Please select the following link for a list of contents for volumes 1-12 published from 1992 - 2003. 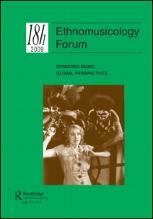 To obtain previous issues of Ethnomusicology Forum (volume 13 onwards) please contact Taylor and Francis (Routledge). We are very pleased to announce that Ethnomusicology Forum has been accepted into the Arts and Humanities Citation Index (AHCI). We received confirmation of this from Thomson Reuters in 2015, since when the AHCI has been taken on by Clarivate Analytics. This is an excellent confirmation of the quality of our journal and the standards attained by the contributors and editorial staff. Please make this widely known to colleagues and encourage them to submit articles and proposals for consideration. We are delighted to report that Francesca Lawson recently received the 2015 Society for Ethnomusicology’s Jaap Kunst Prize for her 2014 article “Is Music an Adaptation or a Technology? Ethnomusicological Perspectives from the Analysis of Chinese Shuochang” published in Ethnomusicology Forum 23(1): 3–26. The citation for her award provided by Prof. Britta Sweers (Institut für Musikwissenschaft, Bern) notes that, ‘the article not only represents excellent scholarship with strong ideas that could contribute to an enhancement of the discipline. It particularly also contains a high potential of advancing ethnomusicological research into a deeper discourse with linguistics, as well as with the “hard” (natural) sciences. The article hereby also displays a high potential of contributing to a stronger—and necessary—interdisciplinary perception of ethnomusicology in general.’ Many congratulations, Francesca! Access the article here. Congratulations to David Kaminsky whose article, “Gender and Sexuality in the Polska: Swedish Couple Dancing and the Challenge of Egalitarian Flirtation” in Ethnomusicology Forum 20(2), August 2011, pp. 123–52 has been given the Marcia Herndon award for 2012 by the Society for Ethnomusicology. The citation reads: “The Herndon Award Committee identified David Kaminsky’s article as one that demonstrates innovative application of theory and is written convincingly using compelling ethnographic data. It is a critical analysis of the interactions between two forces currently at work in the Swedish polska dance scene: a gender--- neutral pedagogical system and a heteronormative social dance environment.” In recognition of the award, David’s article has been made a free download for a limited period of time. Routledge has recently set up a Twitter page for the Routledge Music journals. We will be sending regular updates to our followers so that they can keep up with what is going on with Ethnomusicology Forum, as well as our other titles in the Routledge Music list. We will be sending information on news and developments with our journals, calls for papers, forthcoming special issues, special offers and events. We felt that, in particular, this would be an effective way to communicate with students and getting them to read and use our journals more regularly. Ethnomusicology Forum will be featured on here from time to time, with direct links to articles/calls for papers/information on special issues etc. This is designed to raise further awareness of the journal, and to tell as many people as possible about new articles and issues. We are currently working to promote our Twitter forum and increase the number of followers that we have – as this is a very new initiative. There is a link below, which takes you directly to Twitter. If you feel it is appropriate, do please send the link on to your colleagues and students so that they can register to follow us.